It's hard to regard the social media race as, well, a race. Companies will try and best each other on different fronts, but as a whole, each one has a very different set of goals, to the point where none of them are directly competing. For LinkedIn at the moment, it's mainly about ensuring that their almost half-billion users stay interested. While LinkedIn is the only viable job-hunting social media platform on the market, they have historically struggled to maintain a solid core of active users. For many people, it makes more sense to just completely disconnect job hunting and networking from the social media experience, and LinkedIn doesn't seem to offer much of a reason to rethink that ethos. 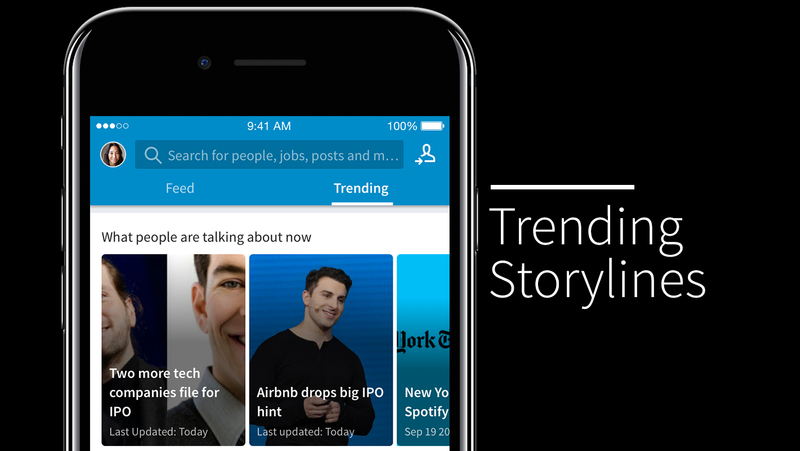 One of LinkedIn's earliest ploys to keep people on the platform was the in-house content - articles written and shared on LinkedIn and nowhere else, but now the allure of that is wearing off, and they've introduced something else - Trending Storylines. These are essentially clouds of related news stories, sourced both from outside and inside of LinkedIn. It's launching first in the US only, with just three categories to choose from - tech, finance and healthcare. Rather than being arranged by algorithm, Trending Storylines will be curated by 24 living, breathing people. Machine learning gets involved after that, but only for rearranging the clusters depending on which users are viewing them - so basically no two people viewing the same cluster will necessarily see the same thing, it will depend on what they like, post and comment on in their daily activity. LinkedIn have been trying to make content more personalised since they picked up the Pulse app back in 2013, and recently they completely revamped their desktop website, so this was likely in the works even before that, intended to follow shortly after the new coat of paint. As well as lumping relevant topics together, new hashtags allow you to bounce between the different Storylines depending on which aspect of them you're most interested in. This bunny-hopping effect could make LinkedIn a far more viable platform for news browsing, which addresses their most significant problem - the amount of time people actually spend on there.